David Orr’s first collection brings a wry malevolence to poetry’s beloved middle-class domestic interior. This is a territory more deeply explored by female poets: the home, the harm, lurking children, and delirium in the kitchen. Orr’s work reveals not only the complexities of the home but also the extent to which gendered expectations have shifted. 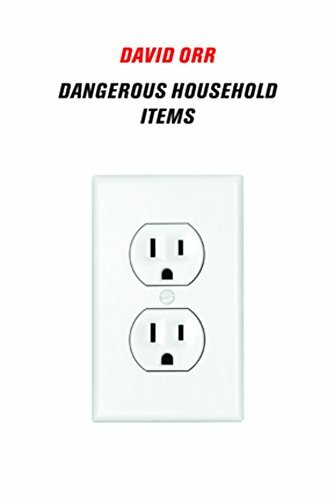 Staring at light sockets with a fork in hand is no longer restricted to depressed teenagers and housewives on the edge. Now home is a madness in which everyone partakes. Orr is best known as a critic. He is the New York Times Book Review’s poetry columnist. His book Beautiful and Pointless: A Guide to Modern Poetry has become a scriptural standard for contemporary poetics. While Dangerous Household Objects is his first collection, Orr brings with him a deep, even saturated awareness of the state of American poetry. Most often, that awareness carries him through the mires of a first collection; only occasionally, it pulls him down. Family lore walks the line between security and fear in “Daniel,” wherein the noises of a new house acquire the name of a spirit. It’s blamed for power-outages and fallen Christmas trees. “Daniel” is playfully blamed for lost objects and disappointments; inevitably, he becomes responsible for everything the family would deny: “When the kids forgot to feed the goldfish / And it turned up dead, its eyes silvered over / Like water shadowed under sheets of ice, / Well, that became Daniel too.” The parent pauses, worries. What would children do, given permission to blame an intangible other? “The Heroine” abandons both traditional and feminist revisions of fairy tales. The American myth of specialness, that each person is magical and talented, chosen for greatness, is impossibly heavy. For this princess, ordinary life beckons: “She had always been special / And had resented it since childhood.” Though she defeats evil by “a storm drain near the Olive Garden, / Just to the right of Joe’s Tacos,” all she wants is freedom from specialness. The girl who flees suburbia isn’t seeking her own greatness but fleeing from it. Retail work is safety. No animal companions disturb her at her tasks. Orr’s poetic language is a modern mythic reminiscent of Alan Ginsberg. “Fable” offers a child a lion (“‘not,’ said the father, ‘a symbolic lion’”: this is a “lion for real”). The lion follows its boy through his walk to adulthood and the illness of his father. The sufferer “was trundled about and filled with cisplatin / And drugs to relieve the side effects of cisplatin.” These drugs aren’t Ginsberg’s marijuana and heroin. They’re the altered-body state of the aging, almost-ancient beatnik on the edge of the death. It might not be Ginsberg’s style, but it’s Ginsberg’s mythopoesis returning. The mythic grows heavy-handed, though, in the book’s second section. “Fata Morgana” explicates the term and its mythical origins, links it to the mythology of the Northwest Passage. “Fata” is a competent poem, but how it found itself within Dangerous Household Objects is something of a mystery. One wonders where these epic illusions lurk. They are in the Arctic, yes, but mustn’t they also be under that stack of magazines? No? No. The poem slumps on, complete in itself, looking for a home in another book. Other pseudo-epics find their place. “Cheney in Italy” begins with an excerpted review of the former vice president’s memoir, and from there launches into a dream-vision of illness. It’s a poem of global warfare couched in the daily rhythms of private life. Cheney’s dreams are of coffee and newspapers: “The paper / Is covered with names: Syria, Iran, / Manama, Quetta, Kandahar, al-Faw . . . / The names are beautiful, removed from sentences.” Orr’s decisions allow years of war to pervade the vision of security and peace. No heart attack can totally protect the man who brings war, no matter how deeply he burrows into domesticity. Orr uses the domestic as a metaphor rather than an end in itself. Though it never steps into social or political commentary, Dangerous Household Objects gestures constantly to global tensions just outside the frame of family life. Domestic comfort, Orr whispers, won’t save us. Either the world will burst through the pipes and walls, or weltschmerz will pull our beautifully-arranged bookcases down around our ears. Invasive species will eat our pets and contaminate our dreams. Home is here, and it is unsafe.